« What’s So Bad About Dying? By the time this posts, I may be a new mommy. But as The Hitchhiker’s Guide to the Galaxy says: DON’T PANIC! When I moved from New York to Georgia, my chihuahua, Oliver, stayed behind with my mother. He was supposed to come live with me once I got settled, but in the end, he was happy with Mom and she was happy with him and so he stayed. And I’ve missed having a dog ever since. I go out of town a lot and boarding is expensive. I’m only supposed to have two pets, per my lease, and I ended up accidentally adopting a couple stray kittens along the way, then brought one of my mother’s cats home with me this summer after a visit to Buffalo, which made three. I didn’t want the added responsibility. Well, last Thursday, The Universe took the decision out of my hands. Maybe. I don’t know for sure yet, but I have a sneaking suspicion. The mailboxes are at the bottom of the hill that is the parking lot in my townhouse complex. Nearby are two Dumpsters. When I get home from work every afternoon, I drive down to the mailboxes, get the mail and then back up to my house. Last Thursday, a small dog with a collar ran in front of my car and I almost hit her. She ran across the lot and behind the townhouses. I got out of my car to look for her, but didn’t see her anywhere. After I got the mail, I went home and stepped out back to see if I could see her. I heard barking coming from my right and walked around to find her on the porch of a neighbor’s house who wasn’t home. 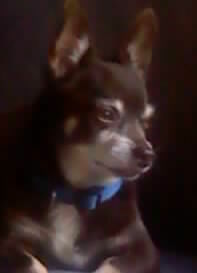 She was growling and barking and baring her teeth, tail between her legs: a tiny miniature pinscher. There was no way I could get near her without injury, so I decided to get some twine and make a slip knot to go around her neck so I could take her inside where it was safe. The neighbor’s next-door neighbor was coming home at that moment, so I asked if she was the dog of the people whose porch she was on. The neighbor said no, they don’t have a dog. I got the twine and successfully lassoed the little dog. Almost immediately, she stopped barking and growling and asked me to pick her up. Immediately, I noticed a great deal of ticks on her tiny body, some of which had been there quite a while. Into the house, get the ticks off (I had to leave a couple until someone came home to help me hold her still), call the animal shelter and a couple other places the shelter suggested and nothing. No reports of a missing dog of her description. 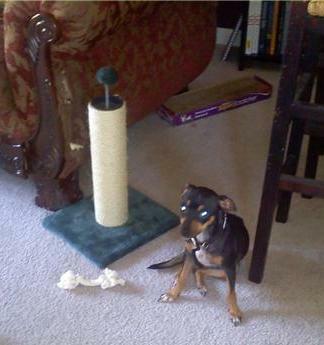 Now, she is a min-pin, but her ears and tail are not cropped and she’s been fixed. She was thin, but not so starving that her bones stuck out, so she’d eaten recently. She has a collar, but no tags and no tattoo indicating a microchip. Someone cared for and loved this dog. No one has reported her missing in any of the obvious places. Chris said he’d seen her running around the area for a few days. Friday, I checked the newspaper and www.craigslist.com and placed my own ads. There were no ads for a missing dog of her description in those places, either. She’s a very sweet dog, although the cats may disagree. They don’t seem to enjoy being chased. Harry is double the dog’s size (literally — I weighed them). I think the dog got a noseful of cat claw Friday morning, though, so the chasing may cease sooner than later. Possibly by the time this posts. Right now, it’s a waiting game. Someone may call. But my gut tells me no one will. And that brings me to my point: We don’t choose our pets; they choose us. I’ve been thinking about wanting a dog more and more lately, and suddenly, this tiny creature scared and in need literally crosses my path. She’s small enough to travel easily almost anywhere I might go. She was in my house for only seconds and already behaving as if she’d lived there her entire life. I would never have gone out and adopted a dog in the near future. So one adopted me (maybe!). TUESDAY UPDATE: Still no calls or e-mails and she has no microchip. Our cat, Byron, showed up on our doorstep when he was about 8 months old. We took one look at each other and somehow knew we were meant to be a pair. Byron lived with us for 18 years. He was the best pet we ever had, and fearlessly protective of our family. When the children were little he would follow them down the street to their friend’s house, wait on the doorstep until they were ready to go home, and then follow them home. When Anthony was 10 months old, Byron saved him from a rattlesnake. And once when Jim and Lauren were out on a lake fishing where Byron knew there was an alligator, he stood on the edge of the lake pitching a fit until Jim and Lauren finally gave up fishing for that day. His favorite place to sleep was in one of my flower beds; I was constantly fussing at him to move and stop ruining my flowers. But when he died we buried him in that bed. Jim and our children gathered around with a glass of wine and each of us took took a turn telling a Byron story and toasting him with the wine. Byron was a member of our family and meant to be so. Enjoy Lily. She’s a beaut. That’s a beautiful story, Leigh. What a wonderful kitty you had. It does really sort of seem ‘meant to be’, doesn’t it? It really does. I’ve heard nothing yet. I’m pretty sure she’s ours. I think so. We’re going on a week and no one has contacted me. I did everything I could to find her owners and no one is stepping forward. I’m a little wary to spend money on a vet and crate and all of that because someone could still come forward. I get paid on Monday, though, and I’ve set that as my deadline to call the vet and get all the supplies (obviously, she has food and leash and some treats right now, but I haven’t spent the “big money” yet). 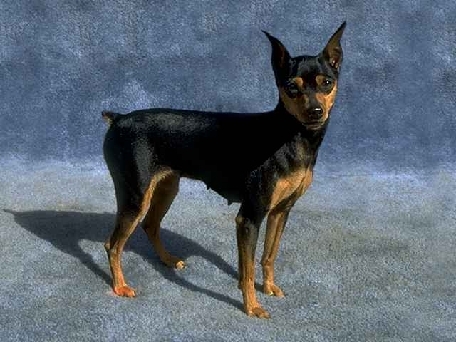 miniature pinscher are adorable! they look so smart too! I had a full sized one…which I prefer big dogs to the mini’s BUTTTT….for indoors…these dogs are great companions! Quick they are! So, I take it you intend on keeping her should nobody claim her? I’m definitely keeping her if no one claims her (looks likely). I prefer big dogs for the most part, but a small dog fits my lifestyle and budget best, so she’s perfect! She is very smart, and made herself at home pretty quick. She keeps chasing my cats, but it’s obvious she knows she shouldn’t. And she seems to be trying hard not to give in to her instincts to do it. The look on her face when she sees them is priceless. She wants so badly to chase them, but knows she’ll get in trouble if she does. I don’t know why they arne’t putting her in her place better, though. One of my cats (as I wrote) is twice her size — HUGE black boy with some sharp nails. This is wonderful! Obviously, she needed a mommy to love her. That YOU were the one that found her is no coincidence. The same thing happened to a friend of mine. She was wanting a dog, but not looking or anything. Boom little black poodle abandoned at the park. They did everything to find the owners but no luck. Pong was born. She is the sweetest dog. These orphan dogs “know” how great they have it. They are truly appreciative and loving animals. I have an abandoned girl as well. Before she eats she lifts her head up for a pet. It’s her sweet way of being grateful (every time). What a blessing you have! Enjoy! The loveliest cat I have ever had the pleasure of being in my life came to me as a stray when I was young. We had Twinkle (named by me after an english comic book) for 10 years. He was my best friend. This was meant to be and she is cute as a button. Every pet I’ve had but one (my mother wanted a manx cat, so she bought one) has been a rescue or a stray. They make amazing pets. As for the exercise, I’ve been there and I know what it’s like. You just have to force it until it’s a habit. But it’s so very worth it. Good luck! She is so cute! And I love the name (my black and tan dog is Lilly). I hope it works or continues to work out for all of you! Thanks! I think I knew your dog was Lilly, but I forgot. 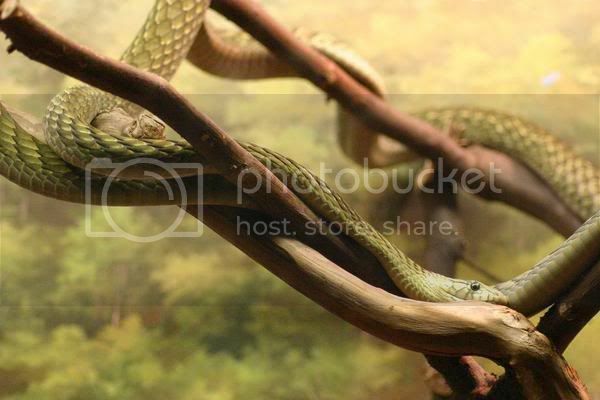 on November 24, 2009 at 10:10 pm | Reply Melissa B.
Oh, enjoy the new member of your family. A new baby, just in time for the holidays!